Your browser loads Search.searchlwradar.com, but the results you receive are provided through yahoo.com? If so, you most likely encountered one of the browser hijackers that use a modified Yahoo search engine. Unfortunately, using such a tool could be dangerous since not all of its displayed content might be reliable, for example, some part of the displayed results could contain suspicious advertisements from the third party. Each time you click such content you might endanger the system as some the ads may lead you to unfamiliar websites that could be harmful. Needless to say, there are more reliable search tools to pick like Yahoo or Google, so we advise our readers not to take any risks with Search.searchlwradar.com and get rid of it as soon as possible. For this reason, our researchers prepared manual deletion instructions that you will find at the end of the article. As you realize, Search.searchlwradar.com is not an entirely new threat, but more like a clone of many other browser hijackers alike, for example, Search.searchtcn.com, Search.searchlttrn.com, Search.yourinterestscenter.com, and so on. If you wonder what use is there from creating these clones, we can tell you that by doing so their developers are probably trying to generate more advertising revenue. Like we mentioned at the beginning the search engine is a modified version of yahoo.com and it might display additional advertisements from the application’s third-party associates. Therefore, it is entirely possible its creators might get paid if such ads are being clicked. If the user got a reliable search tool in return for helping generate advertising revenue to its creators, it would seem like a fair deal. However, Search.searchlwradar.com developers do not give any promises about their search engine or the third-party content it might display. The program’s End User License Agreement says the search engine’s developers disclaim any warranty and take no responsibility for any damage that could arise from their software’s usage or interaction with the third-party content. Thus, our researchers doubt the provided ads are reviewed, and if they are not, there is a chance some of them might be potentially dangerous. For instance, such advertisements may originate from web pages that could be created to distribute other browser hijackers, adware, potentially unwanted programs or malicious threats like viruses, Trojans, and so on. Furthermore, another reason we would not advise you to trust Search.searchlwradar.com is the way it might enter the system. Our researchers report the search engine could be distributed with suspicious pop-up ads, for example, displayed by another similar threat or with bundled software installers that could be spread through untrustworthy file-sharing web pages. This is not how legitimate programs are being distributed, although it does not mean the browser hijacker is malicious either. Nonetheless, because of its working manner, the search tool might introduce you to potentially dangerous content, and for this, we advise you to get rid of it as soon as possible and find yourself a more reputable search tool you could use without fear it might cause any harm. 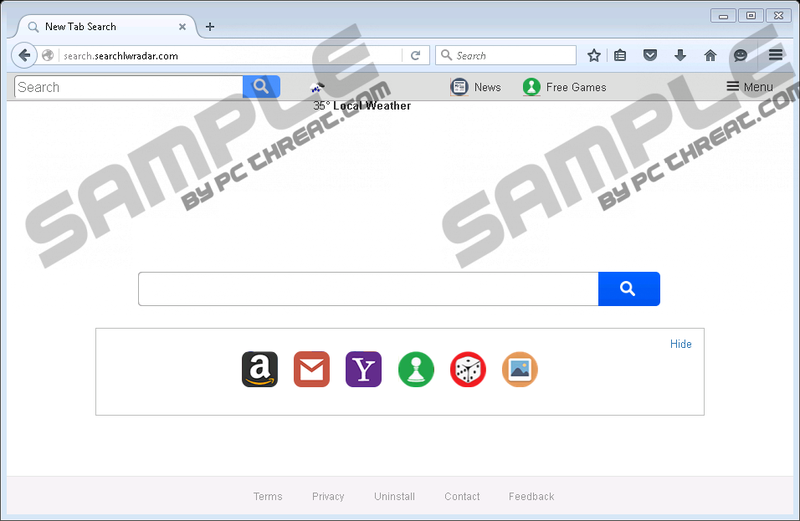 For now, the browser hijacker is compatible with Google Chrome, Mozilla Firefox, and Internet Explorer. It can be removed manually from all of these browsing applications if you know how to find and fix or erase the files that were modified by the threat. All necessary steps will be explained in the deletion instructions located at the end of this paragraph. If you complete all the given steps correctly, you should successfully restore modified browser preferences and remove Search.searchlwradar.com once and for all. Of course, the provided instructions could seem too complicated for you and in such case we would recommend using a trustworthy antimalware tool. It could erase and fix all data modified by the browser hijacker automatically, so all you would have to do is set it to scan the system and click the deletion button. The best part is that acquiring such a tool can strengthen the system as it can guard it against many different threats. Find a value name called Start Page. Right-click it and press Modify. Replace http://Search.searchlwradar.com with a reliable link and click OK.
Find data called FaviconURL, FaviconURLFallback, TopResultURL, and URL. Right-click each file separately, and press Modify. Replace their current value data and press OK. Locate a file called Prefs.js. Then open it as a Notepad document. Find the same code line: user_pref(“browser.startup.homepage”, “http://Search.searchlwradar.com”). Replace http://Search.searchlwradar.com with a trustworthy link. Find data titled as Preferences, Secure Preferences, and Web Data. Right-click it one by one and select Delete. Quick & tested solution for Search.searchlwradar.com removal.